E-textiles are providing ways to integrate technology into our daily lives, making advanced functionality available without sacrificing comfort. Flexible, stretchy, washable, thin, cost effective—these attributes are making a host of new products possible. 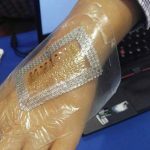 As textiles allow for movement and direct contact with skin over a large area, they lend well to body monitoring or simulation applications, such as pressure monitoring in beds or for measuring particular medical vital signs. Industrial and interior design applications are also growing. 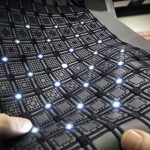 Advancements in smart textile technology are seeing more diverse combinations of electronic materials with different textile fabrics for a wide range of functionalities. Nowhere else has smart textile technology become more diverse in its design and functionality than in wearables. 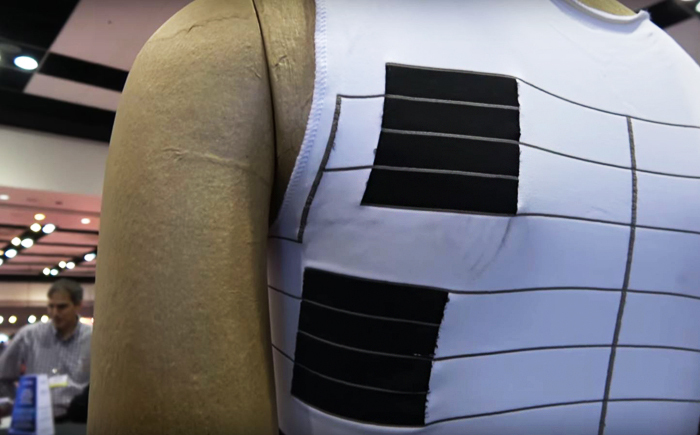 Smart garments are being designed to measure an assortment of variables from body movement to heart rate to respiration and integrating more actuator technology. In collaboration, Myant has developed a wearable form (i.e. shirt) of a functional electric stimulation system. The garment replaces traditional gel electrodes and has areas providing electrical stimulation for the major muscle groups of the upper body. This would be incredibly beneficial in people suffering injury or stroke who need passive electrical stimulation to rebuild or strengthen their musculature and regain lost motor control. 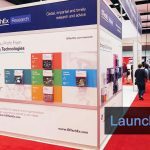 The technology of Ohmatex is actually finding applications out in space. Developed for the European Space Agency (ESA), Ohmatex’s smart pants have embedded EMG (electromyography) sensors which monitor the electrical activity of the leg musculature, plus embedded oxygen sensors. The pants provide feedback about muscle activity during astronaut training in altered gravity conditions as well as monitoring for astronauts working up in the space stations. 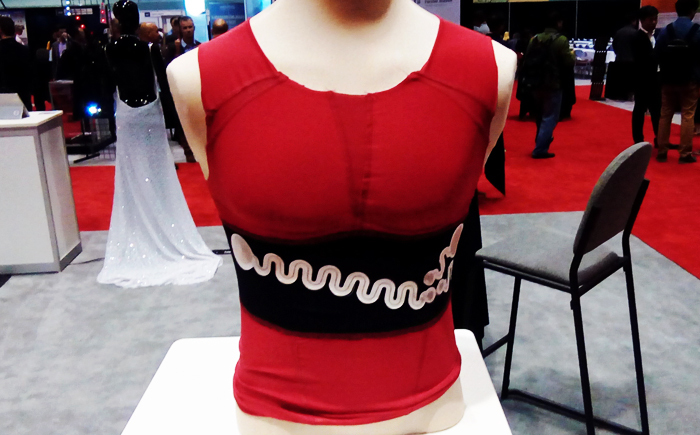 Ohmatex, in partnership with Texisense and Proteor, has also made possible the development of a wearable t-shirts brace made for people suffering with scoliosis. The integrated pressure sensors offer feedback about body position (i.e. whether the back is straight) or how much force is exerted against the brace in different areas. The technology can also provide exercise guided via a smartphone app to help people maintain posture and strengthen their musculature. The garment comes equipped with a wireless charging feature for the control unit. 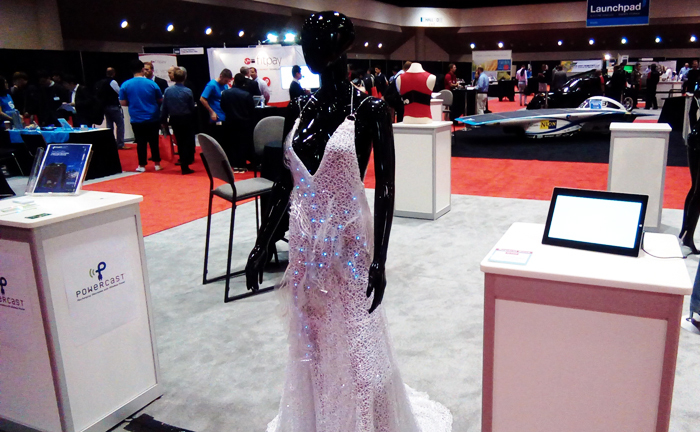 In the exhibition floor’s ‘Apparel Zone’, N.C. State University’s College of Textiles showed prototypes for an ECG shirt and an ECG dress with LED integration. The signals from the electrodes attached under the ribcage are collected by an accompanying device and relayed to an Android smartphone via BLE. The prototypes demonstrate the possibility of health-monitoring smart garments to take on new and exciting design forms. Figure 10: The inner working of a prototype ECG measuring smart shirt. 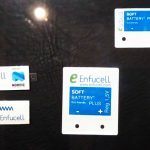 The sensors relay data to an attached device that transmit the info via BLE to an Android smartphone app. Figure 11: This beautiful gown has ECG measuring capabilities and LED integration demonstrating the uniqueness of combining fashion with functionality. One of the signature features of smart textiles is the ability to cover large areas with sensor-enabled fabrics. Continuous, large-area sensing has found productive applications in verticals like medicine, health and wellness, and sports and fitness. Figure 12: A sample of Boditrak’s elastic, breathable pressure sensing e-textile. The pattern alternates between conductive and non-conductive columns. Boditrak’s smart fabric contains a pressure-sensitive elastic material that varies resistance with force layered in between material that has conductive and non-conductive columns. 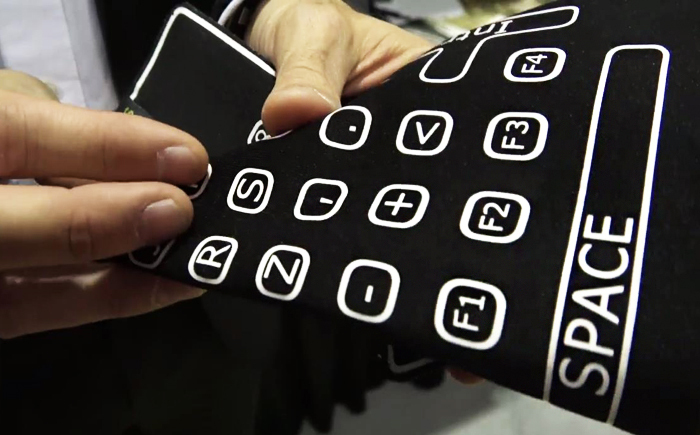 The outcome is a stretchable and breathable smart-textile that can be used for pressure mapping. For medical applications, the material can be used in hospital beds or wheelchair seats to detect areas of high or prolonged pressure, allowing for the prevention of pressure sores. Beyond just pressure sensing, the data can direct a hospital smart bed to automatically shift the bed pressure away from areas susceptible to bed sores. The increase in available data with automated technology could greatly help medical staff keep patients healthy and comfortable. Further, a smart bed equipped with this material can also track vital signs such as heart rate and respiration. 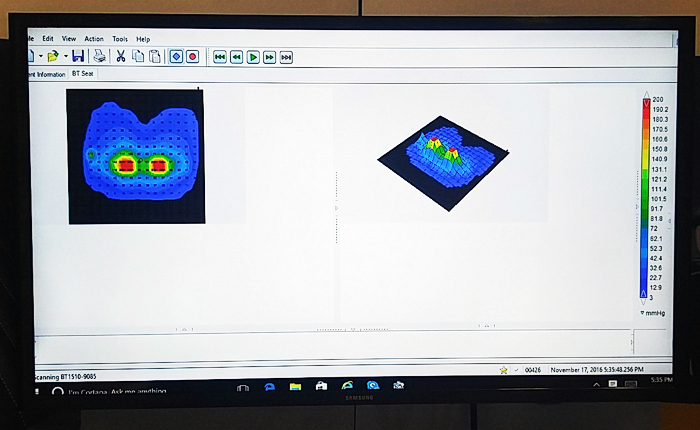 Figure 13: When covering a seat cushion (e.g., office chair or wheelchair cushion), Boditrak’s pressure-mapping technology provides feedback on body position. If fed to a controlling mechanism, the data can then be used to automatically adjust settings for comfort or to prevent pressure damage. 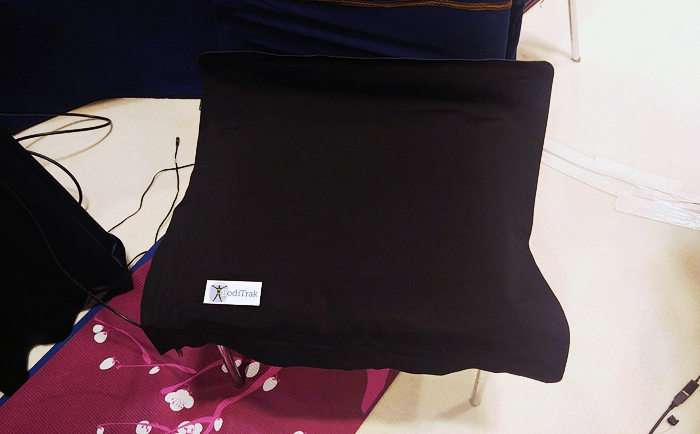 Figure 14: This wheelchair seat cushion can be used to monitor pressure, helping to guide body positioning and prevent sores. On the wellness front, the fabric can be used to make smart beds for consumers, allowing for sleep monitoring and automatic adjustment of sleep conditions. Some of the most popular current sleep technologies allow only for manual adjustment, so a person sets their mattress firmness once at night and it is not adjusted until further manual feedback is received. With Boditrak’s technology, the bed would receive continuous feedback on body positioning and pressure and be able to automatically adjust even while a person is sleeping, similar to its use in hospital smart beds. Such automation and responsiveness would bring unparalleled and convenient comfort. The material can also be used to make smart garments, tracking body movement and health variables for fitness and wellness purposes. When developed as a mat, Boditrak technology finds function in serving sports and fitness. The mat provides important data on how an athlete interacts with the ground. For golf, the mat can provide feedback on weight shift during swing and other data to help coaches and athletes fine-tune skills. Balance and movement assessment can also be helpful in sports medicine settings for performance evaluation and review of care protocols. 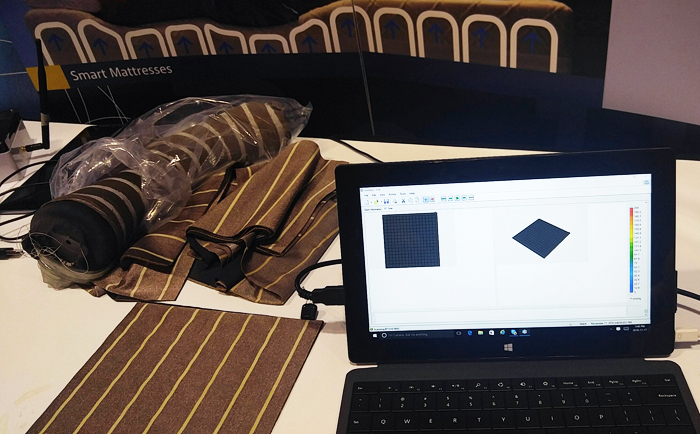 Sensing Tex’s smart textile technology is also finding applications in seat mats, ground mats, bedding, and wearables. 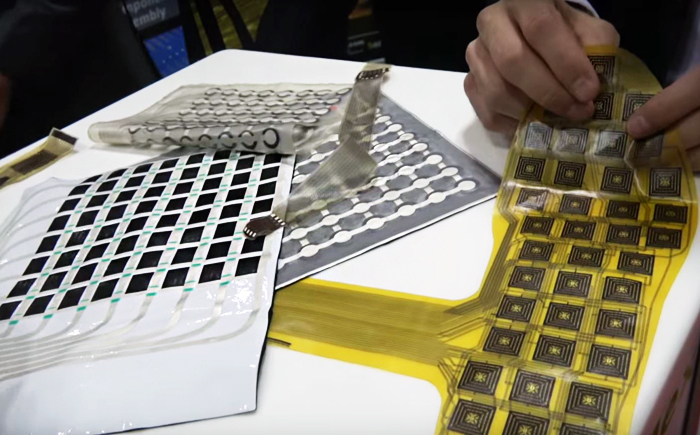 Their technology involves printing flexible, elastic conductive inks and pastes on specially-prepared materials to achieve an operational electronic system, which can then be integrated into other materials or technology. 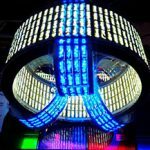 By using printing technology, multiple materials can be used simultaneously – such as temperature and pressure sensors and light emitting technology – allowing for added functionality. Further, as the technology is formed in just one layer, the benefits of less material add up in cost savings and greater expression of positive e-textile attributes: thinner, lightweight, more flexible, etc. The creations enabled by Forster Rohner Textile Innovations highlight the wide range of applications possible with e-textile technology. Forster Rohner is a material/component supplier, integrating conductive materials (over 130 possible materials) onto fabric using industrial embroidery techniques. Their goods can be used to make anything from heating elements to garments equipped with conductive patterns that can sense pressure or proximity, for example, or wearables with body-monitoring sensoring capabilities (e.g., EKG, EEG). 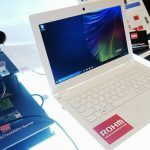 With respect to the future of e-textile technology, new innovations are becoming more focused, finding their own specific niches where they can be of most benefit. Consumers will soon have their pick of fashionable functionality to add to their increasing smart lifestyle.